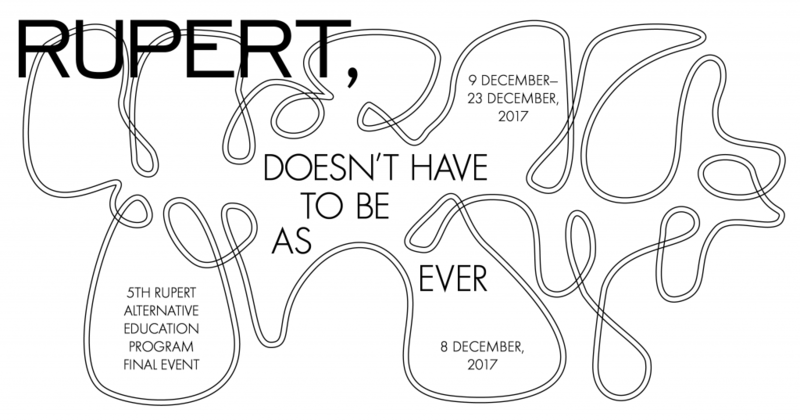 Rupert is pleased to invite all to the final event ‘Doesn’t Have to Be As Ever’ of 5th edition of Rupert Alternative Education. Participants Žygimantas Kudirka, Kristina Marija Kulinič, Nina Kuttler, Beatričė Mockevičiūtė & Gintautė Skvernytė, Kęstutis Montvidas, Andrej Polukord, Eglė Razumaitė, Gediminas Žygus (with collaborator Holly Childs) will present new installation, video, sound and performance works developed during the program. From 8 December, Friday, 6 pm, the event will traverse various spaces in and around Vilnius, its starting studio “keturivaržtai” (Tauro. str 18). Entrance is free of charge. *Precise date & time of the performative lecture is to be announced according to weather forecast suitable for astronomical observation. The 5th Rupert Alternative Education Program is curated by Adomas Narkevičius and partly supported by Lithuanian Council for Culture, Ministry of Culture of the Republic of Lithuania, Vilnius Art Academy and Vilnius City municipality. Special thanks to Molėtai Astronomical Observatory, Que Pasa, keturivaržtai, Contemporary Art Centre Vilnius, UAB “Iviltra, UAB “Agrošiltnamiai”, Kirtimai Culture Centre, Pakrantė.